It’s been a hot minute since I had a frappe, honestly I don’t think I had one all summer, I was on a bit of an iced coffee binge preferably black no sugar or just a touch of milk, so going from black coffee to a frappe is a very big jump in sugariness. It seems I’ve saved up all my gingerbread recipes and gone on a rampage, I’d apologise but seriously, why wouldn’t you want to put gingerbread in everything (there’s another recipe coming and I am so excited about it, but then I think I’m done...for this year!). This is also the third recipe I’ve used ice cream in, honestly, I just have this thing about ice cream in winter. Hot cosy meals and cold desserts is the way to go. This is the first time I’ve made a dairy free frappe; I’ve been putting it off for a while because my original recipe has condensed milk in and it makes a big difference to the flavour. If you’re trying to make a white mocha frappe at home, trust me, condensed milk will become your new best friend. 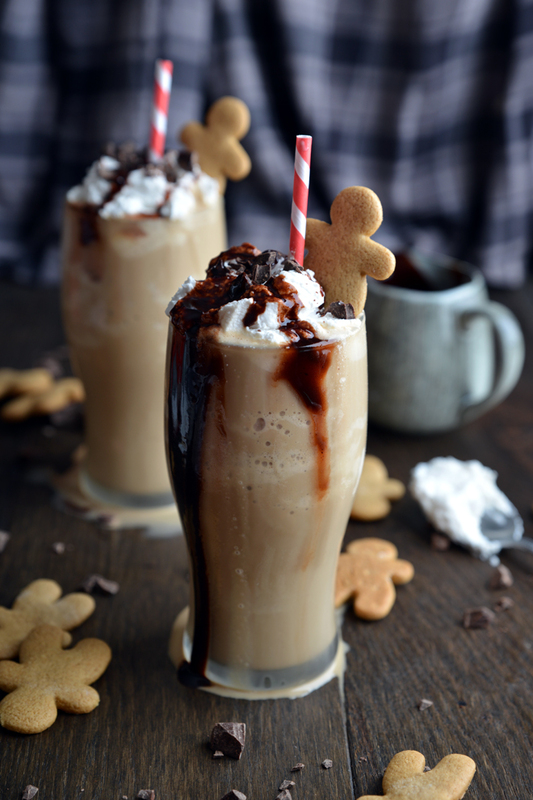 I was all prepared to make this and feel like it was missing something but I think its spot on, as this was gingerbread flavoured and it needs to have a sort of molassesy vibe, muscovado sugar was a perfect alternative. Add the sugar to the espresso shot or instant coffee in water, once the sugar has dissolved add a few ice cubes and set aside. 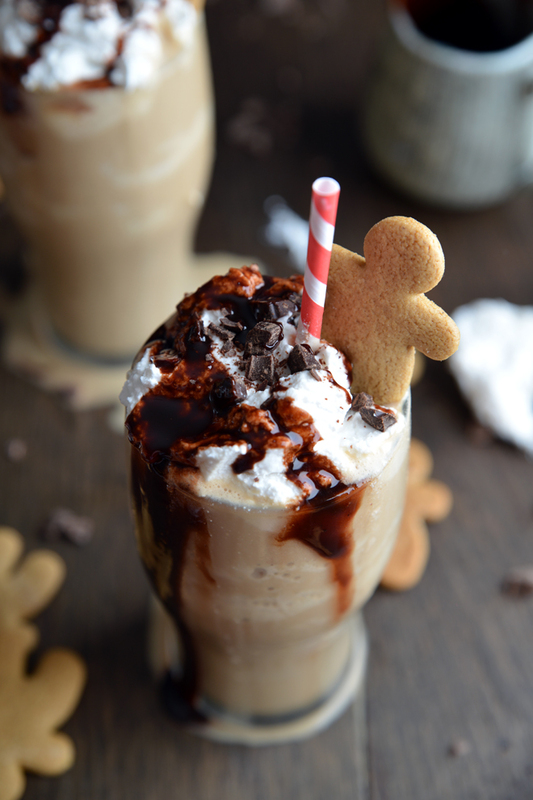 Add the ice cream, gingerbread man/men, milk, vanilla and cold coffee to the blender and blend until smooth, add the ice (I usually need about 8-10 large ice cubes) and blend until a slushie-like consistency forms. 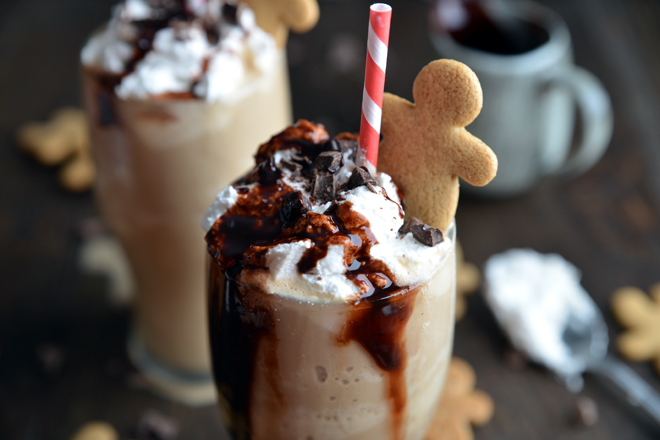 Top with cream (I used coconut cream), chocolate syrup, chocolate chunks a gingerbread man or anything else you can find to pile on top and drink immediately. I am just sitting here and wishing that there was a way that I can get it right now from my laptop screen. Thanks for sharing an amazing thing that all of us like a lot.